Wilbert Janvier Killed, 7 Others injured in Martin County Van Crash | Schuler, Halvorson, Weisser, Zoeller & Overbeck P.A. 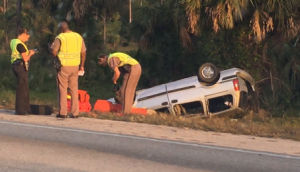 Wilbert Janvier, 50, of Belle Glade was killed and seven others injured after a van overturned on Interstate 95 in Martin County, Florida Highway Patrol reports. Wilbert Janvier was traveling southbound on Interstate 95 near Palm City when he suffered a tire blow out. Janvier lost control of the 2003 Chevy Venture, according to a crash report. The van overturned, and Wilbert Janvier died at the scene as a result of fatal injuries suffered in the crash. Seven passengers, all adults, were transported to Martin Memorial South Hospital and Lawnwood Regional Hospital with serious injuries. Betty Pierre, 33; Lorcius Juste, 76; Lifaite Joassaint, 85; Maria Elliphep, 40; Felix Destin, 60; Joseph Charles, 65; and Prosper Charles, 65, all of Belle Glade, were the injured passengers. It unclear if the passengers were wearing seat belts prior to the crash, the report indicates. Florida highway patrol is investigating the cause of the crash further.